Even with thousands of AoIP-based studios around the globe, there are still people just beginning to wet their feet in the streams (sorry for the pun – we couldn’t resist! ), so we thought it might be helpful to describe just what some characteristics of a productive ecosystem are. Automagic mix-minus and talkback. In the AoIP ecosystem, mix-minus (or clean feed) and talkback are automatically created, then automatically routed to their destinations. 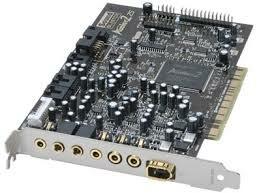 And, GPIO are bundled with their associated audio stream, and follow any source selection. 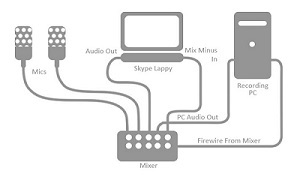 This means that in normal, everyday operation, mix-minuses to phone systems and codecs are created automatically — whether the call is put on-the-air live, or recorded for playback. And a button press on the console can send a closure elsewhere, to activate a two-way radio system, etc. Mix-minus (or, more generically, “backfeed”) isn’t limited to phone hybrid and codec sources. Backfeed is automatically created for any source which also has an associated return path — even if that return path is a completely different path. For example, a TV-truck satellite feed from a breaking news story might have a return audio path via a dial-in, auto-answer phone hybrid. A modern IP-Audio console creates the appropriate backfeed (in this case, mix-minus with IFB) and automatically sends it to the assigned auto-answer phone hybrid. Backfeeds aren’t li mited to “remote” sources, either. They can be in-studio guests with mic and headphones. A productive environment will feed Program audio to each studio guest, but allow individual IFB (“talkback”) to each guest individually. In an IP-Audio mixing and routing environment, this is accomplished with no extra wiring, but simply with a few configuration selections. No audio cards in production or playout computers. 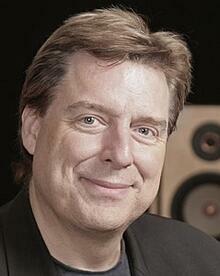 Audio is “pure-play,” sent via Ethernet from PC NICs. GPIO is also supported over the same Ethernet connection, to allow remote start with no tangle of tinned leads and D-Sub connectors needed. True city-to-city connections are easy. Not only is the audio easily routed (and discovered by the operators), GPIO is maintained between sites so that a closure at one end is sensed and acted upon at the other end. This occurs whether the IP-audio interconnect between cities is a full-bandwidth IP-Audio pipe, or a more limited-bandwidth connection (like those used for data-compressed audio codecs). 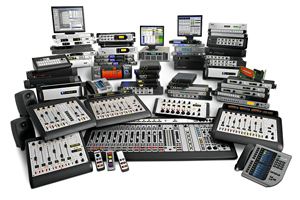 Source equipment is defined by portable “profiles.” Any piece of equipment on the network that is used with a console has a customized configuration which enables its operational characteristics to be automatically adjusted to a pre- defined norm, no matter what control surface or software mixer it’s loaded onto for use as a source. That means that once you’ve saved an EQ curve or voice compression settings for a talent mic, those settings follow that mic whenever it’s assigned to a fader, anywhere in your facility. And that GPIO closures for Codec sources behave the same in every studio that codec is loaded to. You can easily see how useful this consistency is. Finally, and perhaps most importantly: Partner gear makes direct connections via IP, not via analog breakouts or logic interface boxes. The beauty of a true IP-audio network is that all the connections – audio, logic, profiles, metadata, backfeeds – are made using a single IP connection. There is full interconnectivity via IP, and this includes not just linear, low-latency audio, but also GPIO and more sophisticated control and monitoring protocols for instant routing at the destinations. It’s true of all great inventors, futurists and technologists that they have one overriding thing in common: a unifying vision that clearly shows the way forward. Not all of them have it, but the great ones do. Now, you’ve seen Steve’s vision of broadcast’s future. Better, you can use it as a yardstick to measure how much progress any broadcast-related technology has made toward achieving that ultimate goal: the one where building studios is as easy as click • connect • broadcast.